Particle & Surface Sciences introduces the new ASAP 2020 HD accelerated surface area and porosimetry system by Micromeritics USA. The ASAP 2020 HD accelerated surface area and porosimetry system is designed to offer improved isotherm resolution and accuracy. Current ASAP 2020 users can also upgrade to the new HD standard to benefit from these new capabilities. Surface area and porosity are important physical properties that influence the quality and utility of many materials and products. 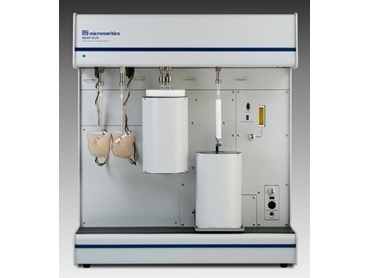 Gas adsorption equipment from Micromeritics is ideal for measuring these properties on a wide variety of materials such as high-tech ceramics, catalysts, fuel cells, carbons, pharmaceuticals, cosmetics, paints and coatings, super-capacitor components, propellants, geological materials as well as aerospace materials among others. Micromeritics offers a wide range of instruments to fit applications such as increasing the speed and efficiency of routine quality control analysis to providing the accuracy, resolution and data reduction for exacting research requirements. Particle & Surface Sciences also offers support solutions such as installation and service of all instruments by factory-trained technicians in addition to an Analytical Laboratory and a Sales Department to assist with enquiries.